Having selected Euro as currency, starting at a basket value of 99 € you may apply for "Installments Powered by PayPal". sera marin GVG-Mix is the staple food consisting of carefully manufactured flakes and dried whole food animals for all marine fish that prefer to eat at the surface. The tasty, varied blend is rich in minerals and trace elements such as iodine, and thus optimally fulfills the natural requirements. This effectively prevents deficiencies. Healthy growth, liveliness, splendid appearance and strong disease resistance are supported. The food keeps its shape, is excellently digestible and does not pollute the water. 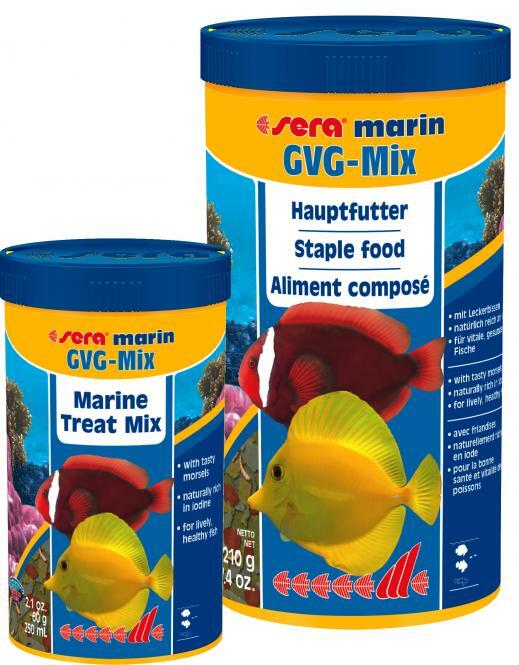 fish meal, wheat flour, Ca-caseinate, brewers yeast, krill (3.6%), sea algae, gammarus, bloodworms (2.7%), daphnia (2.7%), whole egg powder, spirulina, mannan oligosaccharides (0.4%), cod-liver oil (containing 34% omega fatty acids), herbs, stinging nettle, alfalfa, parsley, paprika, green-lipped mussel, spinach, carrots, Haematococcus algae, garlic. Crude Protein 47.7%, Crude Fat 7.0%, Crude Fiber 3.8%, Moisture 5.2%, Crude Ash 12.3%. Vitamins and provitamins: Vit. A 33,640 IU/kg, Vit. D3 1,640 IU/kg, Vit. E (D, L-α-tocopheryl acetate) 109 mg/kg, Vit. B1 32 mg/kg, Vit. B2 82 mg/kg, stab. Vit. C (L-ascorbyl monophosphate) 500 mg/kg. sera marin GVG-Mix Marine Treat Mix,B-ITEM - 1000 ml - New, packaging damaged, 10% discount! Do you have questions about this item? You have a pet shop, are commercial breeder, or otherwise active in the pet business, and have a valid business registration? Please contact us, we also operate a wholesale and can offer you our products at an affordable wholesale price. Rate product - You get 25 bonus points for each rating. Only purchased products can be rated. Good basic food. All fishes like this one.